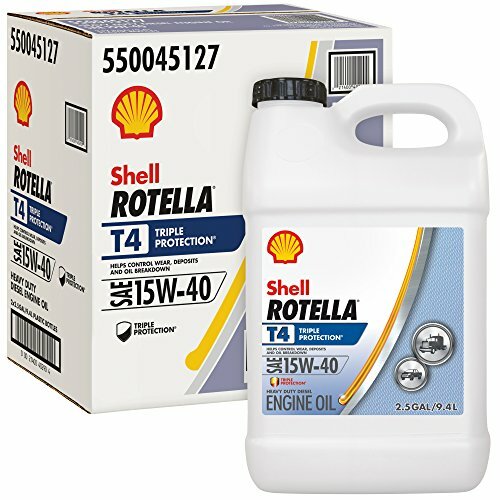 Rotella T4 15W-40 Triple Protection Heavy Duty Engine Oil is a Energized Protection of Shell Rotella heavy duty diesel engine oils provides protection in three critical areas. Acid control; helps protect against corrosion from acids formed as fuel burns and as the oil ages. Deposit control; helps keep engine clean for optimum performance and long life. Wear control; helps keep moving metal engine surfaces apart for long life. T4 Triple Protection oil uses advanced additive technology to protect under the most severe engine conditions found in modern, low-emission engines. Recommended by a wide range of OEMs, suitable for both the latest low-emissions and older model equipment. If you have any questions about this product by Shell Rotella T, contact us by completing and submitting the form below. If you are looking for a specif part number, please include it with your message.